"Cal-Earth gave me everything I expected and more. It was an inspirational experience that challenged assumptions and pushes participants to be better builders and better people." This is a fascinating firing process to see and be a part of. Raku firing is dramatic and exciting. It is also a wonderful way to actually watch the glazes melt and see what happens inside the kiln in a matter of minutes. Bring your own bisque pieces to glaze fire if you choose, or purchase bisque pots made by instructors and glaze and fire them. 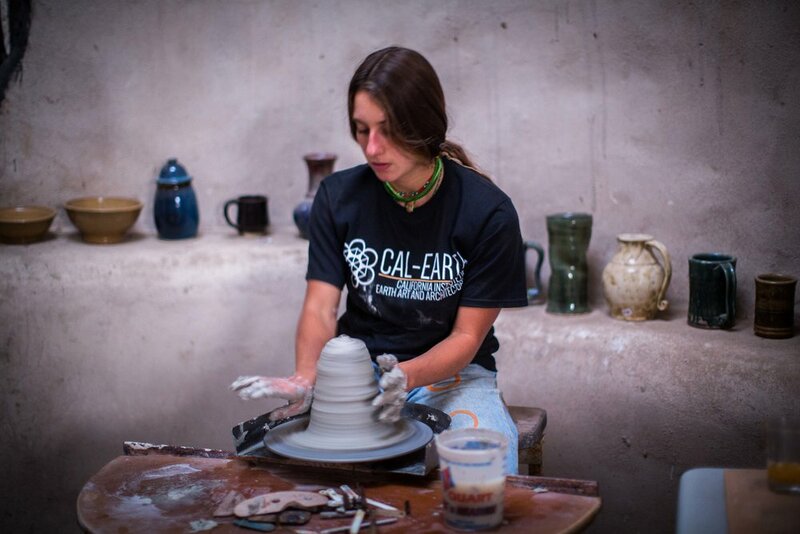 Our ceramics apprenticeship at Cal-Earth will provide students with an opportunity to learn about clay and ceramics, create and take home functional and sculptural art work, and design finish elements for Earthen structures. Learn with ceramic artist and Earth builder instructor, Brandon Evans. Come stay at Cal-Earth this Summer to be inspired and learn to take clay from its raw moldable form and fire it into timeless and livable art!